Although Election Day is only a week away, there has been no big turnout of Early Voters in Danville or Vermilion County. Sandy Delhaye, Director of the Danville Board of Election Commissioners, says there are 17,350 active voters in the city. But by late Monday morning March 25th, 2019) only 265 had voted early. And Lindsay Light, Chief Deputy and Supervisor of Elections for the Vermilion County Clerk’s Office, also says early voting has been very light. Light says 125 people have cast early votes in person. In addition the office has mailed out 160 ballots to people requesting them, and 94 have been returned. In Danville voters will be electing a mayor, city treasurer and seven city council members in addition to Danville District 118 and Danville Area Community College Board members. Danville residents are also voting for Regional Board of School Trustees from Vermilion County. City Council and village board seats, along with school board races are the main races attracting voters around the county. You do not have to give an excuse as to why you are voting early. In addition to their regular hours this week, both the Danville Election Commission and County Clerk’s offices will be open for Early Voting on Saturday (March 30th, 2019) from 9:00 a.m. until noon. 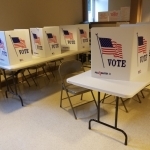 Danville residents may cast their Early Votes at the Danville Election Commission office which is located in the basement of the Vermilion County Administration Building at 201 North Vermilion Street. The office is located on the south end of the building and there is a ramp leading from the outside to the basement for persons with disabilities. Those residents who live outside Danville, but within Vermilion County, who want to vote early can do so at the Vermilion County Clerk’s office. It is located on the first floor of the same building. The offices are no longer located at the former Vermilion County Courthouse Annex.